Led Power Flares is especially designed for police, firefighters and rescue first responders to assist them during their work. This unique technology is now available to consumers and essential to keep in your automobile and to take along on your next boating, biking or hiking trip. This compact led safety puck light emits 360° of ultra-bright light from an array of 16 LEDs, visible up to 10 miles away. 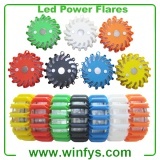 led power flares manufacturersis very durable, water proof and can resist extreme temperatures. The Power Flares has 9 functions with the ring of red LED lights that circle it giving you the various combinations using an included computer circuit to light up the RED LED's. The light combinations include rotating around the puck, quad flash, single blink, alternating blinks, SOS Morse code, steady on with high and low output, 2 and 4 LED flashlight. The Power Flares is a great safety light with the various attention getting flashing and blinking lights along with the on with two or four of the LED's to use for a regular flashlight. The two and four LED lights work well for emergency use like changing a tire or finding your way when the power goes out while the rest are great for attention getting. Public Repair and Service companies, Motorcyclists, Scuba Divers. They float and are visible when under water, Boaters, Snow Mobiles, Law Enforcement, RTV, Power Flares for the side of road, identify road hazards, signal for help, mark detours, Children play Ice Hockey with them and companies have purchased them for fork lifts, or repair applications. Ideal for emergency responders.